Andrew – Mathematics student, patient, logical. Jasmine – English Language student, complex intolerant, occasionally dopey. 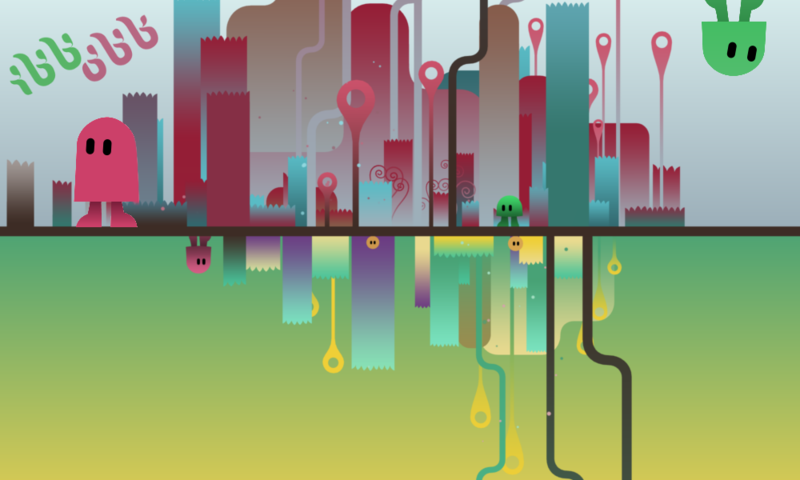 ibb and obb is a two-player puzzle platformer which perfectly merges sights and soundtrack to create a beautiful and atmospheric fantasy universe. This stunningly designed game from Sparpweed does away with unnecessary introductions and tutorials, and without so much as a cut scene, you and your partner are immediately cast into the adorable roles of ibb and obb. The only slight difference between the characters is their height, although this element is barely emphasised. It seems a shame not to utilise this character design more in the solutions to the puzzles. If the differences between the characters served some functionality, this would create a more coherent story; the players would understand why ibb and obb need each other, and why they must work as a team in this delicate, beautiful world. The fact that ibb and obb are very similar characters is somewhat democratic. Because they don’t have special abilities to distinguish between them, players are unlikely to fight over who gets to be ibb and who gets to be obb. Unless you are overly fond of either pink or green, it’s really not going to matter which character you play as. That’s not to say that the differences between ibb and obb don’t ever matter. The game incorporates some areas which permit only the entry of either ibb or obb. Although this is largely arbitrary due to neither character having a distinct ability, the use of these coloured areas strengthens the teamwork elements and adds a lot of complexity to the game. The puzzles in ibb and obb can be immensely difficult, and you really have to think in a certain way to figure them out. However, if you have some patience, and logically go through all your options, you’ll eventually work them out. This is a real strength of the game. The difficulty of the puzzle allows a greater sense of satisfaction, and makes for a much more fulfilling experience than a simple fetch quest. How can a game about two blobs be this difficult? Despite its overwhelming cuteness, ibb and obb is often frustratingly challenging. The game certainly requires a lot of thinking, and most of the game involves ibb and obb just standing still for 20 minutes while you’re trying to figure out how the puzzle is even possible. So many times I would sit there and think, we can’t actually do this one. There is no possible way. However, once you manage to work out the solution, it always seemed so simple and obvious. The puzzles aren’t contrived in any way; they’re just extremely mentally taxing. Although this does allow for satisfaction when you figure out the solution, the game does get pretty tiring, and playing for too long can make you frustrated. There are only a small amount of mechanics within ibb and obb. It is much more beneficial to choose a few mechanics and to focus on developing them, rather than to clutter a game by introducing gimmicky mechanics that are rarely used then rapidly forgotten about. This is what ibb and obb aims to do, and although the mechanics are quite in-depth and sometimes complex, there really isn’t much progression. The repetitiveness of the game may leave players discontented, as it frequently feels like you’re just doing the same puzzle, with the same mechanics, over and over again until you complete the game. Moreover, ibb and obb sometimes does fall into the trap of introducing then swiftly abandoning mechanics. 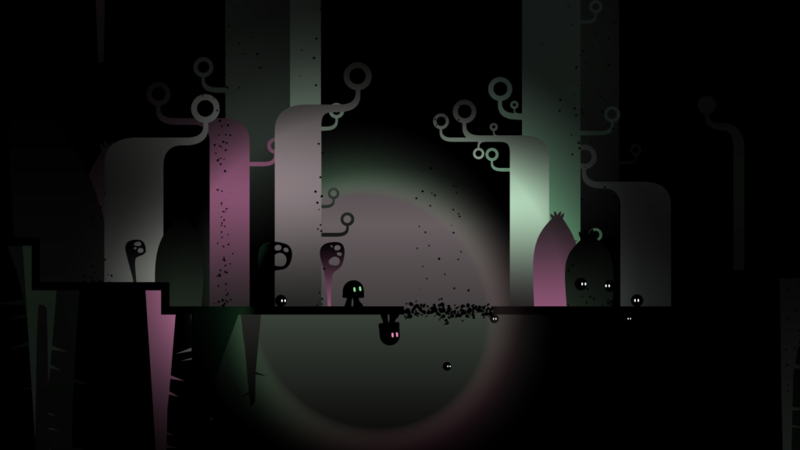 For instance, the game features a dark level in which players must remain close to each other to keep the world illuminated. This is a fantastic mechanic, and the dark level is certainly a highlight, yet it is swiftly cast aside in favour of the familiar colourful, happy levels. Yeah, the game often feels a bit samey, e.g. there is only one type of enemy, and most of the puzzle can be solved in very similar ways. The similarity of the solutions makes it surprising that the puzzles are so consistently difficult. Though maybe they aren’t, and it’s just that we’re bad at the game. The art in the game is incredibly sweet, and the fantasy-like world is beautiful to look at, however there is little variation between the style and setting of different levels. Whilst this adds atmosphere and immersion, levels sometimes feel exceptionally long, and gameplay can quickly become dull. Also, if you happen to be a player with little or no patience, the visually similar levels make it tough to find walkthroughs of the particular level and puzzle on which you are stuck. This is exasperating when you’ve already been stuck for an hour and you’re on the verge of a mental breakdown. The game’s controls are very simple and they feel incredibly responsive. This aids you in completing the puzzles where jumping accuracy is required as it minimises messy landings. The puzzles are difficult enough without having to attempt them multiple times due to slippy controls. As the controls help minimise player annoyance, so does the games checkpoint system. Saving progress frequently, the checkpoints are fairly frequent, meaning there isn’t much to redo if you die. Additionally, the checkpoint system is very fluid. There are no flashy signals identifying checkpoints to spoil your immersion in this fantasy world. The checkpoints could be a little more visible, though. I understand that the game’s atmosphere and artwork doesn’t permit giant flagpoles that label checkpoints, but it’s almost impossible to know when you’ve reached one. This isn’t often a problem, but sometimes it would be useful so you know how careful you need to be when approaching particularly difficult areas. Also, sometimes you kill enemies and collect the rewards, yet going backwards, on the off chance that you’ve missed something, involves going past previous invisible checkpoints. This means that if you die, all the extinguished monsters reappear, only this time without dropping the rewards. As the game recognises that you’ve defeated these enemies before – because they produce no reward points – then why can’t they just stay dead? There is nothing rewarding about having to kill the same set of monsters multiple times once you’ve already reaped the benefits. Teamwork is truly a necessary element of ibb and obb, and this should be true of all good co-ops. Many co-op games are extremely exploitable, meaning that it is often easy for players to complete levels on their own by abusing the game’s mechanics. A stellar example of this is Battleblock Theatre, in which many puzzles involving both players can be solved individually, with the clever use of some in-game weapons. Yet, with ibb and obb, you do really have to communicate with your partner. This is brilliant, as it is rare to find a co-op game so genuinely and fundamentally reliant upon teamwork and communication. As the game is so dependent on interaction, if you and your partner have different ideas and approaches to the puzzles, it can however be difficult for one to grasp the other’s thought process. It can also be difficult to get your partner to try out your ideas when they’re always so convinced that their way leads to the correct solution! Sorry, but if you were right more often, I might have more confidence in you! ibb and obb does feature Steam achievements for collecting all rewards in each level, but this is a very difficult task. The levels are just too long for you not to make a mistake at some point, therefore the sheer difficulty of this task can be off-putting. This can easily lead players to dismiss the possibility of accomplishing the achievements, and somewhat removes the want to play the game again. As it offers little replayability, ibb and obb works out at £8.99 for 5/6 hours of content; quite an expensive game. This is what I find most frustrating about the game. I love platform games, because I love collecting all the things. If I can’t collect all the things, then I’ve failed and I’ll do it again. The collection element of ibb and obb feels comparably unfair. The levels are too long for you to be able to go back and do it all again without any mistakes. Also, the rewards are on a timer and they disappear very quickly. Sometimes you have to kill an enemy to avoid dying, but neither you nor your partner can reach the rewards in time. Sometimes you kill an enemy to release the reward, but your oblivious partner is messing around somewhere else and foolishly dies. This reward is then gone for good, unless you fancy doing the WHOLE level again. ibb and obb is a very unforgiving game, and this can lead to frustration. Since I can’t collect everything, I feel much less involved and therefore much less impelled to actually complete the game. ibb and obb is a beautiful, atmospheric and fulfilling game promoting teamwork and logical thinking. Though not one for the collectionist, ibb and obb is a rewarding two-player game if you think hard and work through the frustration. The game isn’t too demanding on systems and should run comfortably on low end machines, making it a great game to play with your friends. I heard the single player of the game is controlling both ibb and obb at the same time using the twin-sticks. That’s no fun!